This is my cutting counter. I love my counter tool storage system as it keeps everything organized, handy and better yet, it only cost me $18.00. (And it turns too!) You can make one too! First, get yourself a turn table. Mine is old, well used and leftover from my scrapbooking days. Next, find a container you want to use that will fit on top of your turn table. I found mine at a JoAnn's on clearance in the picnic isle for $5.00. It fits perfectly on the turntable with about a two inch overhang around. I found an ample assortment of jars and glasses. I use the jars to store my colored pencils for sketching, embellishments for quilts and my go to thread for piecing. Jars also hold my nail file boards used for creating applique templates and scissors for cutting everything but fabric. So there ya have it! A cutting counter storage assembly that keeps everything at hands reach and doesn't break the bank! I hope I've inspired ya to be creative and thrifty in your organizing! Stop by Sundays for more ideas. I think you have hit on a great idea!! Thanks for sharing. Great idea. Everything is handy and conveniently grouped into containers so that you can just lift out one container at a time. I also like the idea of keeping thin scraps of fabric as ribbon. Now I am in danger of never throwing out my scraps. Love your turntable counter container! I love tools that are handy and out. I'll try and take a pic of my storage tomorrow if it's okay to link up the following day. Thats pretty nifty, thanks for sharing! 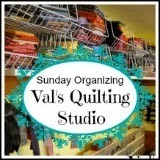 I really enjoy seeing how other quilters store and organize things so I love this series - thanks so much! Wow, what a nice layout. I see you are enjoying it. Dad. I have a turntable type storage piece, but it's packed away... It's much smaller than yours, so I have envy! I do see that you have my pica measuring ruler sticking out the top. Have you been in the printing business? I was a typesetter years ago...(sigh), I loved that job until computers and desk top publishing put me out of business. Computers have put lots of things out of business... it's scary.